We all know of the Tiny Stories. Well, most of us do anyway. It is an effort of Joseph Gordon-Levitt and his team, who encourage tiny stories to be sent from any part of the world, select the ones they like and publish them in a book format under the publishing house, It Books. The Tiny Book of Tiny Stories is another level of storytelling altogether. It is not flash fiction for the sake of the name. Actually it is quite ironical because it stays even after the story is long over and the book is long finished. The book has only 128 pages to speak of and yet the impact is ten times than probably reading a novel would give you. The book can fit easily in your bag and is a sure shot way to make you smile or lift your spirits when down. The illustrations are par excellence. They depict every single story with accuracy and great precision. I cannot stop recommending these tales enough and if you want to have a good night’s sleep then I suggest you read this and go to bed. You will dream in black and white, which will be gorgeous. 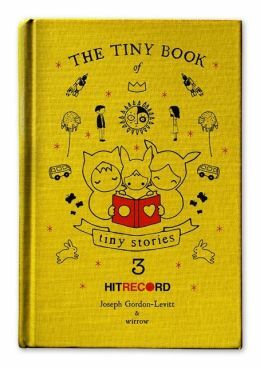 This entry was posted in Books, hit records, It Books, Review, short stories, tiny stories and tagged flash fiction, hit records, joseph gordon-levitt, the tiny book of tiny stories, tiny stories, volume 3 on January 29, 2015 by thehungryreader.